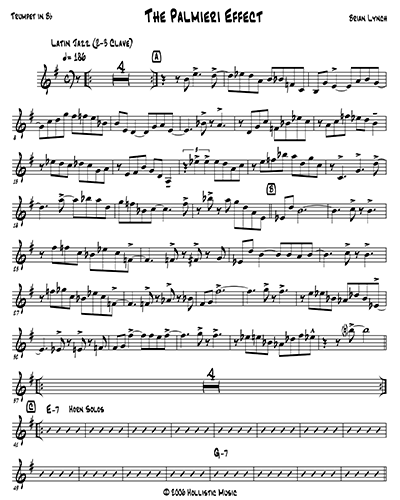 All Sheet Music products are distributed as PDF files, suitable for reading from a tablet or printing. Download links will be made immediately available after purchase. A 2 horn arrangement of the Brian Lynch original "Across The Bridge", as recorded on the CrissCross CD ConClave. 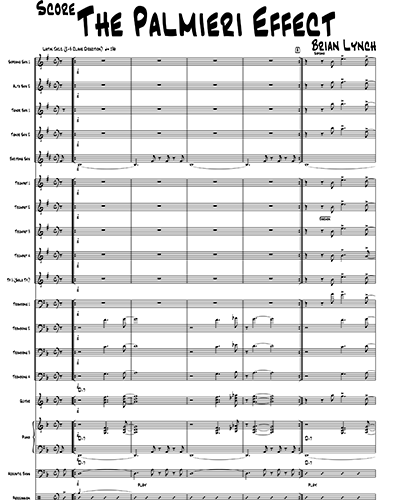 Parts included: trumpet, tenor sax, alto sax (alternate part for tenor), piano, bass, drums/perc., score. 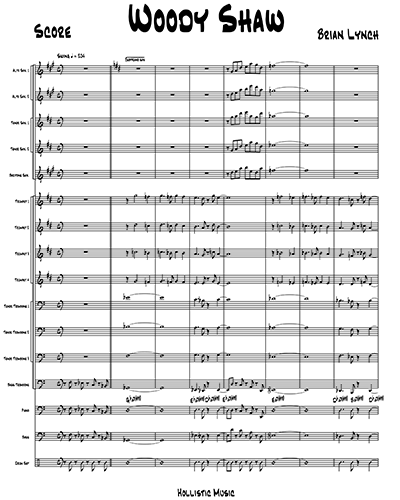 A 2 horn arrangement of the Brian Lynch original "Awe Shocks", as recorded on the CrissCross CD ConClave. Parts included: trumpet, tenor sax, alto sax (alternate part for tenor), piano, bass, drums/percussion. A collection of my originals from the CrissCross CD ConClave. Burning Latin Jazz! 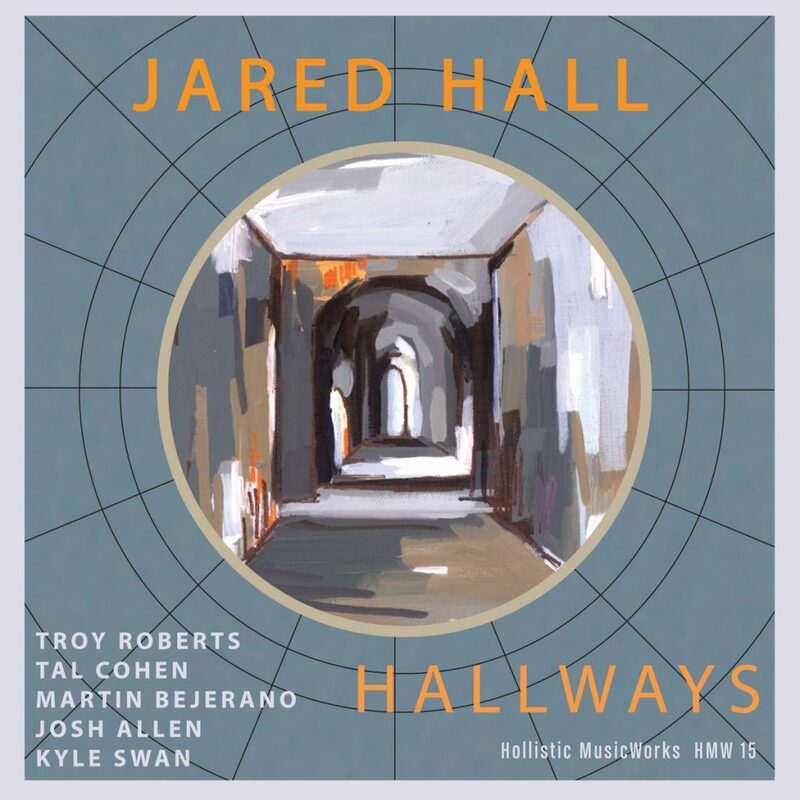 Includes: Tom Harrell, Across The Bridge, JBs Dilemma and Awe Shocks. Instrumentation: trumpet, tenor (alto sub), piano, bass, drums/perc. A 3 horn version of my original "Green Is Mean", recorded in 2 horn form on my Sharp 9 CD Spheres Of Influence as well as on the Art Blakey and the Jazz Messengers CD One For All in 4 horn form. 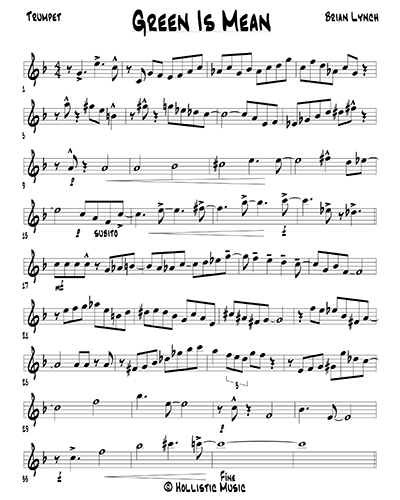 Parts include: Trumpet, alto sax (2nd part), tenor sax (2nd or 3rd part), trombone (3rd part), bari sax (3rd part), master rhythm, and score. As recorded on the Grammy® winning album "Simpático" by the Brian Lynch/Eddie Palmieri Project. Instrumentation: trumpet, alto sax, trombone (tenor sax sub part included), piano, bass, drums/percussion. Full score included. 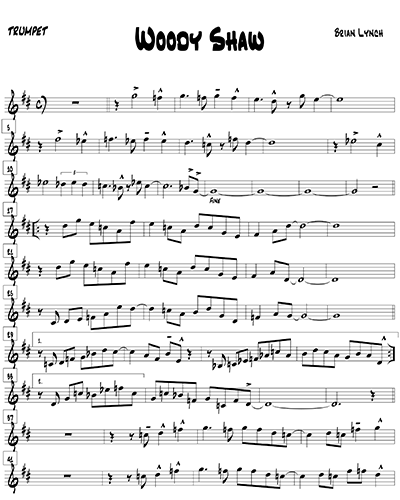 2 Horn arrangement of my original composition "JB's Dilemma" as recorded on the CrissCross CD ConClave. Parts: trumpet, tenor sax, alto sax (sub tenor), trombone (sub tenor), concert, bass, drums/percussion. 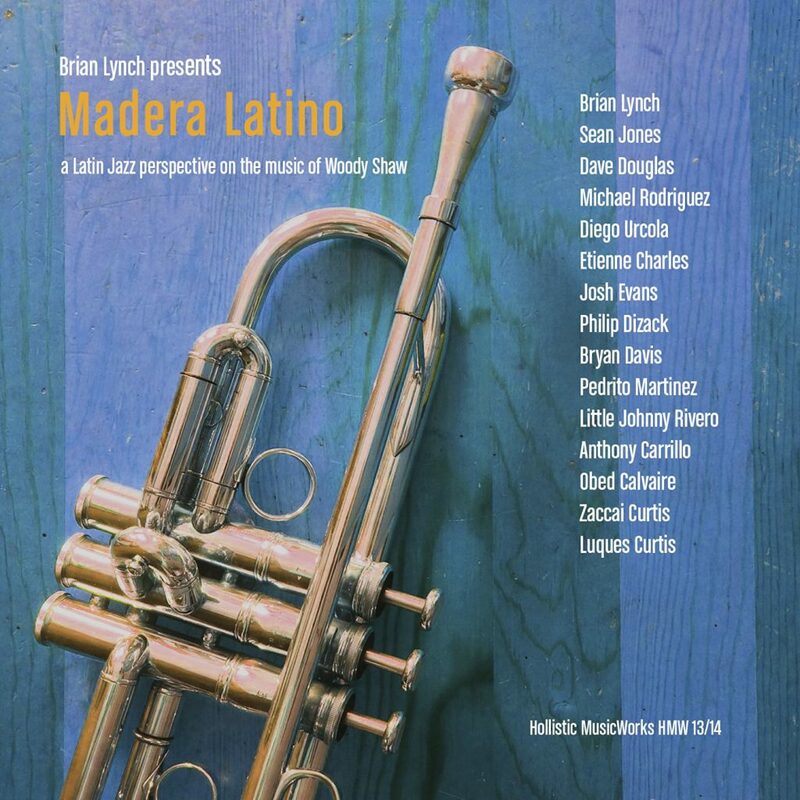 As recorded on the Grammy® Award winning CD “Simpático” from the Brian Lynch/Eddie Palmieri Project. 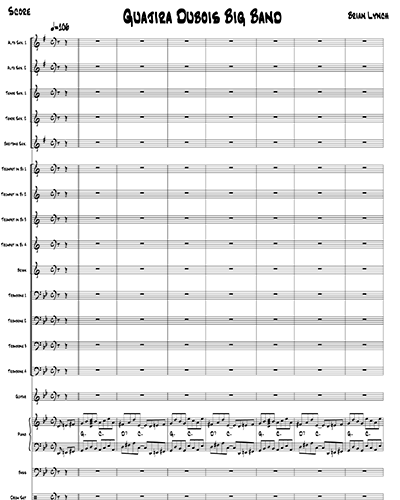 Includes score and parts: trumpet, tenor sax, trombone, alto sax(sub for 2nd part tenor), tenor sax (sub for 3rd part trombone), piano, bass, drums/percussion. Big band version of the Brian Lynch original recorded on The Brian Lynch/Eddie Palmieri Project: Simpático. Instrumentation: Alto 1 (dbl soprano), Alto 2, Tenor 1, Tenor 2, Bari Saxes; Trumpets 1-5 (Tp 5 opt. solo trumpet); Trombones 1-4; Piano, Guitar, Bass, Drums/Percussion. A 2 horn arrangement of the Brian Lynch original "Tom Harrell" as recorded on the CrissCross CD ConClave (also recorded in quartet form on the Sharp 9 CD Tribute To The Trumpet Masters). 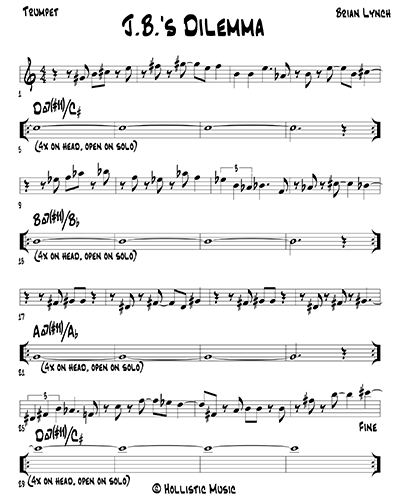 Parts included: trumpet, tenor sax, alto sax (alternate part for tenor), piano, bass, drums/perc., lead sheet. 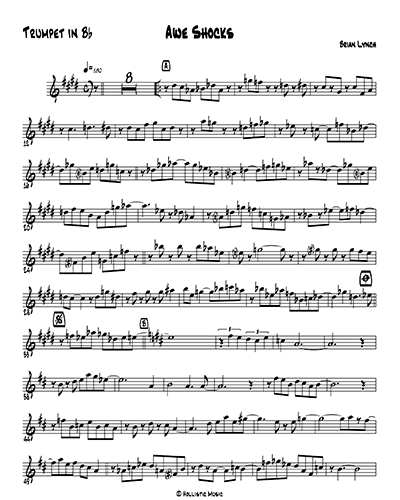 A 2 horn arrangement of my original "Woody Shaw", from the Sharp 9 CD Tribute To The Trumpet Masters. 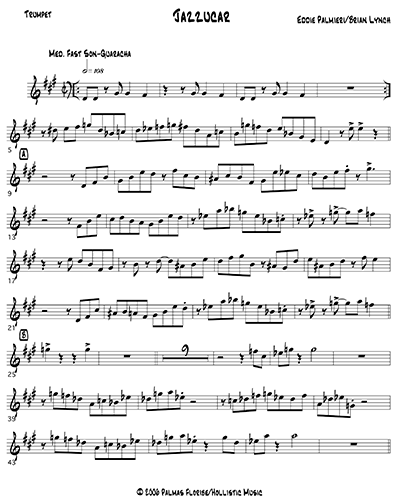 Parts included: trumpet, alto sax, tenor sax (same part transposed), piano/lead sheet, bass. 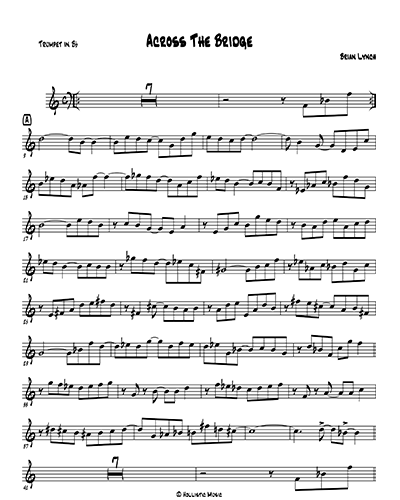 Big band version of the Brian Lynch original recorded in small group form on Tribute To The Trumpet Masters (Sharp 9). 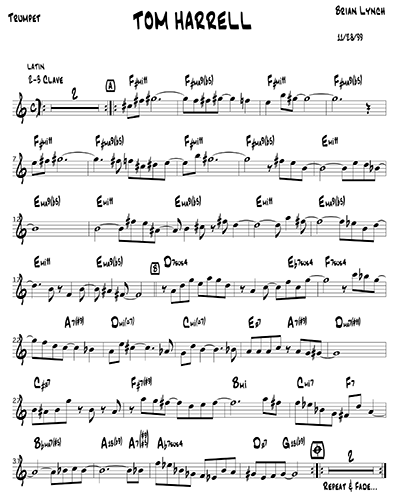 Instrumentation: Alto 1 (dbl soprano), Alto 2, Tenor 1, Tenor 2, Bari Saxes; Trumpets 1-5 (Tp 5 solo trumpet); Trombones 1-4; Piano, Guitar, Bass, Drums. Big band version of the Brian Lynch original recorded on The Brian Lynch/Eddie Palmieri Project: Simpático. Instrumentation: Alto 1 (dbl soprano), Alto 2, Tenor 1, Tenor 2, Bari Saxes; Trumpets 1-5 (Tp 5 solo trumpet); Trombones 1-4; Piano, Guitar, Bass, Drums/Percussion.